Searching for something different to do with your group of Friends? Murder Mystery Events at Maple Hill Manor are sensational! For over 30 years, Maple Hill Manor has hosted Murder Mystery Events – an evening of mystery, intrigue, and delicious food – not to mention, GREAT ENTERTAINMENT & FUN! Enjoy a hilarious game, an elegant Gourmet Dinner, and the comforts of a wonderful historic home. The games are intended to be very interactive ad-lib dialog among the guests, using game clues and accusations provided at the time of the game. Each guest plays a role, lively and hilarious banter occurs throughout the multi-course dinner meal, and a murder will take place by dessert. The objective for everyone is the same – to figure out who committed the murder and why. Prizes to be awarded for best acting, best costume, and SUPER SLEUTH. You’ll wonder when you last laughed so much or had so much fun! 1. JOIN OTHER INTERESTED GUESTS FOR AN OPEN MURDER MYSTERY – 6-7 couples or 12-14 people necessary to play the game. 2. OR, ORGANIZE YOUR OWN EXCLUSIVE GROUP EVENT. Simply, invite 8-18 of your closest friends or family members for a truly unique group social at Maple Hill Manor. We’ll help you coordinate your party by providing the place, invitations, list of characters, suggested costume ideas, a dinner menu, and deluxe B&B Accommodations. We even take care of all the preparations, cooking, and cleaning – it’s just that easy. We do all the work . . . you enjoy all the fun! Simply call 859.336.3075 or email us at stay@maplehillmanor.com. 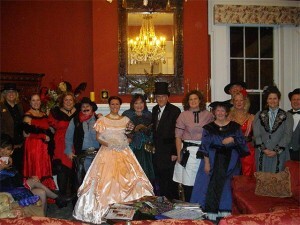 Choose from these Maple Hill Manor Murder Mystery Themes. Join Other Couples for an Open Murder Mystery Date – Call for details and dates. 20% Gratuity on dinner amount of $45/person is requested. Simply call tollfree 1.800.886.7546 or email us at stay@maplehillmanor.com. When calling for reservations, please have two alternate dates, game selection, and total number of people in your party … 14 people, (double occupancy) is an IDEAL party size. Only $45/person PLUS Full House Rental (Discounted 10%) … Discounted to $1249/night. Scenario: based on 14 people in party for a Weekend Date . . . Game, Dinner, and Accommodations with Full Country Breakfast is only $129/person OR $259/couple. Taxes (7.5%) to be added. 20% Gratuity on dinner amount is requested. Full House Rental for one-night is required. Extend your stay a second night and receive the same 10% discounted Full House Rental Rate. No Discounts available for Holidays or Festival Weekends. Minimum of 10 Guests required, with maximum of 18 Guests. If your group has members that cancel, the organizer for the group is responsible for a minimum of 10 guests in order to continue with the game. Otherwise, the reservations involving overnight accommodations will remain, without a game and dinner. Cancellation for Group Events is a 30-day advance notice, $25/room re-booking fee (this applies to any cancellations whether individual rooms or as an entire group, regardless of when the reservation occurs). Cancellations within 30 days of arrival, will be the full financial responsibility of the group, unless rooms are re-booked. Talk it up with your group of Family, Friends, Co-Workers. Call to make your reservation – credit card number is required to reserve your date, no charges until the time of your stay. Each person or couple can pay at that time for their portion using their preferred payment method: cash, check, or credit card. Murder Mystery Package will be sent to you which will include an overview of the Game, Character Listing, Suggested Costumes, and Dinner Menu. Character Assignments, Costumes, and Room selections are at your discretion. Call Maple Hill Manor at least one-week prior to your event date with final menu selections.